What do I do when the clocks go back? With the clocks going back on Sunday,it’s not so bad when they “fall back”. And (supposedly) we get an extra hour in bed. However the kids will, most likely, have different ideas! Every year I get lots of questions about how to handle the clocks going back as regards children’s sleep. Parents are often concerned about how to make the change as easy as possible. In terms of the best way to handle the change, my advice is to “split the difference”. As an example, let’s say your little one usually takes a morning nap around 9.30. Adjust this to 9.00 for the three days after the time change. It will be a bit of a push for your child, as strictly speaking she will be up an extra half hour. But this is not so much that it will have a negative effect on her routine. You can also do the same for the afternoon nap. For bedtime, if your child usually goes to bed at 7pm, I’d recommend putting her to bed at 6.30pm. Do this for the first three days following the clocks going back. This will FEEL like 7.30pm to your child. Then move to 7pm after that. It’ll take about a week for your child’s body to get used to the change. This is the average time it takes for any of us to adjust to a change in sleep habits. If you have a child over the age of two, you can use a Gro Clock and adjust the time for the sun to come up. Set the clock forward half an hour so that at 6.30am it says 7.00am and let them get up a little earlier than normal. By the end of the week, they will be back on track and sleep until their normal wakeup time. Remember to turn off the blue light at night, as this interferes with sleep and can cause earlier wake ups. If you have a younger baby, this won’t work for them. My advice is to try and avoid rushing in as soon as you hear your baby waking up; you don’t want to send a message that getting up earlier is okay now. So if she normally wakes at 7am, but is now up at 6am, wait until ten past the first day, and then twenty past the next, then 6.30am the next day and so on. By the end of the week, your baby’s schedule should be adjusted to the new time and waking up at their usual hour. 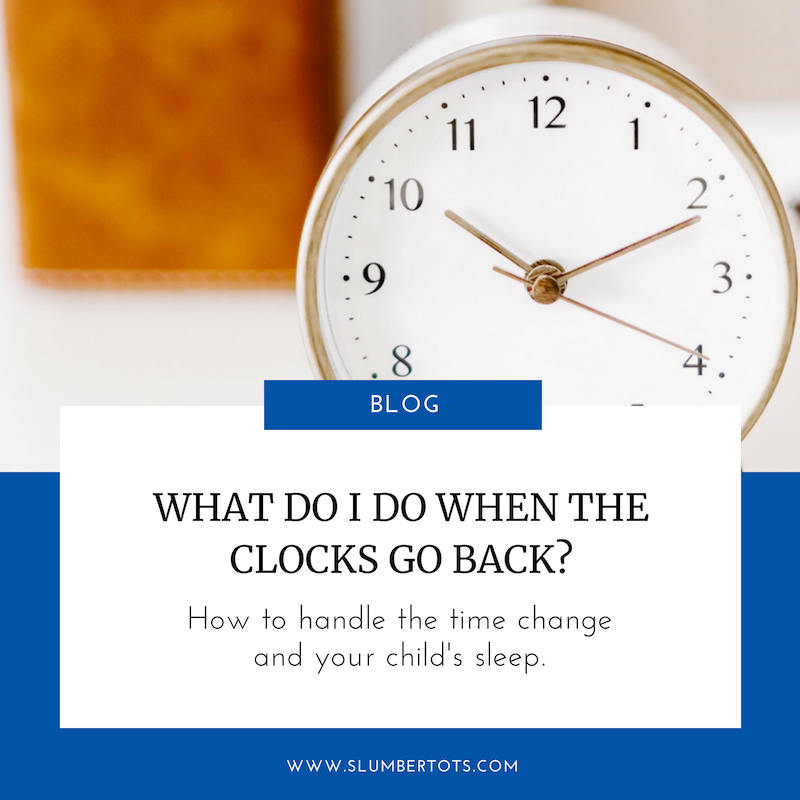 You can do the same at bedtime, and on the fourth night, just get in line with the new time so your baby is back to going to bed when the clock says 7.00pm. Adjust naps to the correct time on day 4 as well. I’m off for a lie down as all this calculating the old and new time has given me a headache, as it does every year! Follow the link to read my blog about the clocks going forward.